During the last seminar I attended of the IDA conference I had a profound “ah-ha!” moment! It was the session I wanted to attend and was so close to avoid signing up for in favor of an earlier flight home after a long week. I am so glad that I went! I have a student who was my “project kid” last year, and is still in my class this year. 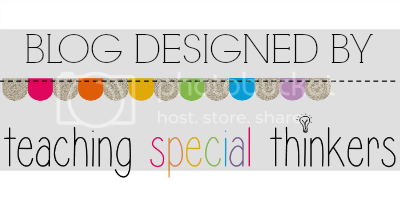 For those who are not my regular readers… every year I pick a “project.” It is my mission to help the one kid in my class that always seemed to fall through the cracks before I got them. The kid that no teacher has found a way to bond with, or previous strategies just didn’t click for the student. Every year, I make it my unfaltering mission to help that kid! I attended Michele Berg’s lecture entitled “Working Memory and Dyslexia: An exploration of the relationship between reading skills and short term, long-term and working memory functions.” Less than 10 Minutes into the lecture about working memory, I was completely enthralled. Within 15 minutes, I mentally screamed “OH MY GOODNESS THAT’S JOSH!” (Pseudonym of course). This got me thinking… how many other kids could we have missed? How many kids have a working memory disorder that is not clearly defined or noticed? I’ve reviewed Josh’s file and I know he has significant delays in this area, but it was by no means the most alarming of his test scores. Yet, every single concern we have had over Josh’s struggles has fallen into the exact realm of working memory outlined in in the presentation. I know and understand working memory, but never made the connection to the various areas it can affect. With this in mind, I have realized how little training teachers receive regarding working memory and its functions. There are things we often associate with other disorders that can be clustered together to show an overarching struggle with working memory. With this in mind, I created a graphic organizer to help show some of the overarching functions of working memory. Read on to see it examined more in depth. Working memory is the ability to process information by putting it to use, and it is used when switching between short and long term memory. For example, it is not simply repeating words, but being able to hear a list of words and then place them in alphabetical order and do something with the information. 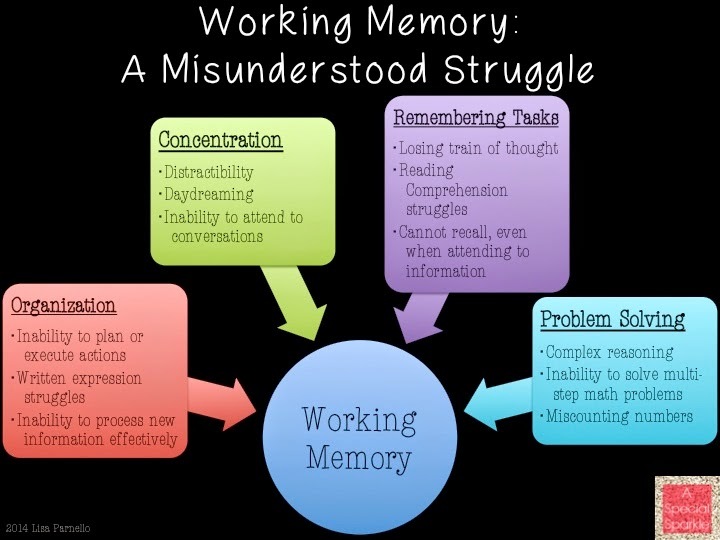 Often students with working memory issues struggle with organization and executive functioning. This occurs when their brain struggles to process what they are doing in relation to things happening around them. They often forget in the middle of a task exactly what they should be focusing on. They struggle to tune out things happening around them and focus on the important information at hand. This often occurs when writing because they forget what they were writing in the middle of concentrating on spelling and forming a sentence. Students with working memory delays often lose concentration because it is too much information for the brain to process. The brain becomes overloaded and easily distracted. Students often daydream during classes or busy conversation because they cannot keep up with the discussion. Students who have trouble processing information, in turn have trouble recalling the information, even when they have been attending to the task. This may happen in reading when they read all the words, but cannot tell you what happened in the story. Their brain was unable to process the information it was taking in. Students may lose their train of thought and forget what they were talking about, even when they had a clear point in mind. These students may struggle with complex reasoning because they cannot grasp a multi-step problem or situation. This can become especially clear during math problems with multiple steps where they lose track of what they have done. They will often lose track while counting as well. Associations- Students often remember information better if they can associate it to something simple and familiar. Teach kids to chunk together information they know and is related. Reduce Workload- This does not mean to reduce the work a child does. It refers to reducing the amount of work the brain needs to do! For example, have a student sound out a word in chunks instead of the whole word at once. Example: Pester could be sounded out as "Pe...pes...pest...pester" which reduces the number of parts of a word the child needs to read at a time. The same can be done with sentence reading. 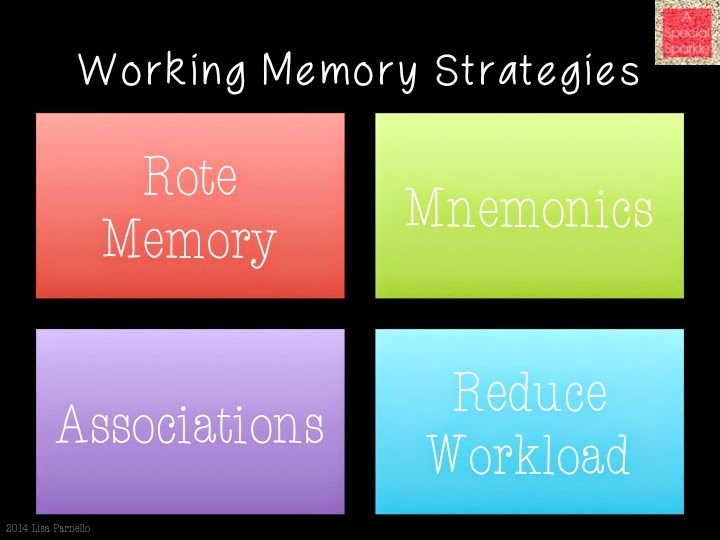 CLICK HERE for a guide on Working Memory!